If you are running Odin Automation (PBA/POA) and use our Local or Hosted Cloud, the following plugin will integrate all SpamExperts services. Allow the user to login to the web interface without having to enter a username/password. Your server/setup needs to meet the following requirements in order to run the SpamExperts Integration add on. Latest version (>=5.1.1) Parallels Automation including the "APS 1.2 DNS substitute hotfix"
Installing the addon is done by downloading it from the APS catalog (search for "*SpamExperts*") or via the Application Manager (Service Director -> Application Manager -> APS Catalog). After you downloaded the package you need to install it. If you already have an SpamExperts Integration Application then you need to click on the application name and under Versions tab to "Import package". If you don't have any SpamExperts Integration Application you need to "Import package" directly. If you already have an SpamExperts Integration Application and you import the package directly on the top level, you will receive an error like: “Error Application with id 22924 does not exist”. As soon as the background task has been executed, the package will be available. Before you can use it, you need to configure it. To use the add-on, you will first need to configure it in the Provider's control panel Service Director > Application Manager > Applications > SpamExperts Integration. An entry named "SpamExperts Integration" should exist. First, a resource type should be created to be able to provision accounts. Go to the tab "Resource Types"
Fill in the 2 sections: Global application settings and Application service "Domain Specific Settings". The addon Global application settings are now ready to be configured. Spampanel URL - Here you have to fill the URL for the SpamExperts Control Panel. Enable SSL - Enable SSL to communicate with the API. Primary MX - The MX record to use for the domain. This is either the first hostname of your server or a special hostname which contains all the primary IP addresses of the servers in your cluster (recommended). Unfortunately, due to limitations in Parallels Automation only one MX record can be configured. Regarding the SpamExperts Control Panel URL, if Parallels Automation is running in (forced) HTTPS mode, we suggest you to use a “HTTPS://” url as well as the control panel URL. If you don't do this, people will get a security warning from their browser stating it wants to download "unsecured content". 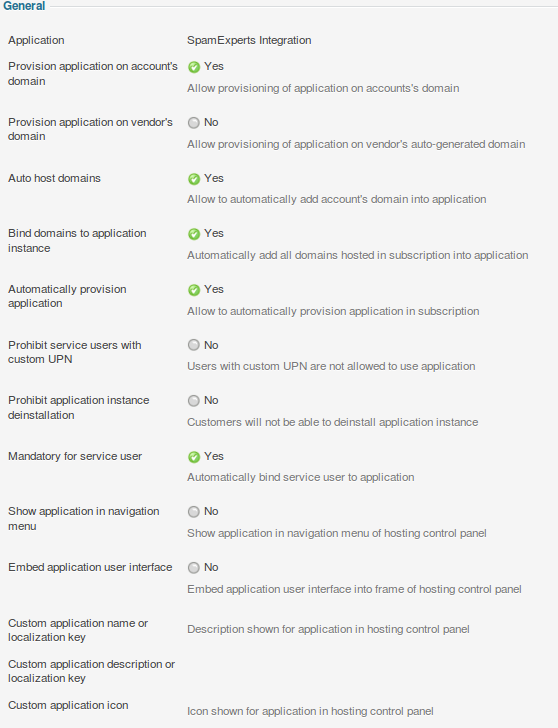 The add on Application service "Domain Specific Settings" are now ready to be configured. Be Advised: THESE ARE REQUIRED TO BE DEFINED IN THE TEMPLATES! All other options should be (left) UNCHECKED. Do NOT check the "Show Application in Navigation Menu", or else you can only access one instance of the application. On the next page, the attribute "External Provisioning" should be ticked. On the last page, you see an overview of the settings. If they are correct, finish up the installation. To make use of the advanced functionality you'll have to create the following Application Services and/or Application Resources. Enable the incoming filtering product: Enables the Incoming product. Set to 0 to disable or 1 to enable. Enable the outgoing filtering product: Enables the Outgoing (product. Set to 0 to disable or 1 to enable. The addon is now installed and configured. You can use these resource types to assign to your packages (to create Service Templates and Subscriptions). An example of the resource types can be seen below. Service Director > Provisioning Manager > "Add New Service Template". After you finished Installation of the Service Template, before to activate it, you need to configure it. Service Director > Provisioning Manager click the new Service Template > Resources > Add resources. Here you need to keep in mind that SpamExperts needs to have DNS and email resources (Disk Space, QMail Hosting, OpenXChange). It is also mandatory to include the Resources (Application, Application Service and Application Resources (Unit)) created before. After you added and set up all the resources, go to your Service Template > General tab and Activate it. The last step before you actually install the application for domain is to create a Subscription. On the last step, you see an overview of the settings. If they are correct, finish up the installation. Now you can sign in the customer account in order to install the application. Service Template > Subscription > click on Company name > General tab > Staff members > "Login as Customer"
Before installing the application you need to do some checks on subscription, domains and users. First you need to be sure that you have the right Subscription selected in the top right corner. On domains check to have the domain hosted for that subscription: Home > Domains > Hosted Domains > domainName > Hosting Services section > Add Hosting. Last step is to check users. If you don't have any users, than go to Home > Users > Add New Service User . 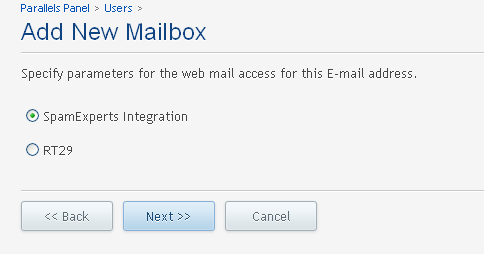 When you create the user be sure that you checked SpamExperts Integration as Mailbox. The user configuration is easy. In order to provision a domain, the user should select "Applications" from the menubar and choose for "Install New Application". In that list, choose for the "SpamExperts Integration". MX record of the domain is changed to the virtual MX record you've configured in the general settings. Be Advised: We suggest you disable the option to change passwords for domain users in the SpamExperts Control Panel. If users can edit their passwords, this will break the integration with the "One Click Login" option. This permission can be turned off by disabling "User's profile" for "Domain" at the "Manage Permissions" page in the Control Panel. 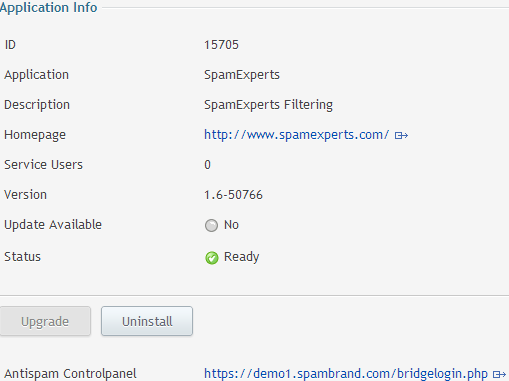 After you install the SpamExperts application and you have multiple domains added, if you click directly on SpamExperts Integration > Entry Point Open you will open bridgelogin.php and you will need to select the domain where you want to login. If you click on SpamExperts Integration and the Entry Point -> Open for a Service User you should log in to that domain application instance. Starting with version 1.5-345 and up, you have the ability to upsell control panel access to your customers. In order to do so, there are some additional steps required to block web interface access to selected subscriptions. In the application, assign an additional "Application Resource (unit)" and give it a name, such as "SpamExperts Control Panel Enabled"
Create a Service Template (e.g. "SpamExperts - Without control panel") with this resource added (on top of the existing ones) and its limit set to 0. Be Advised: The limit should be set to either 0 or 1. Any other value for this resource (e.g. "unlimited") will be treated as the control panel is being enabled. If you do not apply the Resource to the service template, the web interface access will not be blocked. Only an explicitly set value of 0 will be used. In order to disable the web interface for a specific subscription, you can apply the Service Template that includes this resource or edit the subscription's resources to change the values appropriately. Be advised that it's recommended to remove the permission to the Password reset function so this cannot be bypassed to use the control panel directly without going through the one-click login page. Please note that if you want to install it again, you have to wait before the nameserver update task is finished (or you have to force it). Known issues or limitations are caused by APS standard. We are constantly working on resolving them with Parallels. Disabling Outgoing is not be possible if the domain has Outgoing users created. They should be removed first before disabling this service. Although the addon has been tested internally, it is possible that some features won't work as they should due to differences between your server setup and our testing setup. If you're unsure what to do or how to do this, please contact us. Removing the addon is easy, just remove the application each subscription and from the provider's control panel. Please note that this will automatically de-provision all the domains. For some upgrades special care is required, because it may introduce new behavioral changes or changed default values. Before upgrading / providing your customers with an upgrade always make sure you have read this section. If you upgrade from version 1.7 to version 1.8 please make sure the new Application Resources (Unit) have been added to the Service Templates and Subscriptions. By default only Incoming filtering will be enabled, so if these Application Resources are not created it will effectively disable any other services (Outgoing, Archiving) and enable Incoming for a domain which will override any changed domain services that may have been enabled manually via the Control Panel, the Control Panel API or the Software API. We no longer develop new features in the APS 1.2 addon and we recommend that you upgrade to APS 2.0. We will only release fixes for critical bugs or security issues. We will only receive requests for bug fixes that are critical or security related. If you want to further develop the addon, you are welcomed to fork our project on GitHub and develop any additional functionality you want. A description of the problem, if possible steps to reproduce. If you want to upgrade to APS 2.0 please follow our guide from the APS 2.0 Knowledgebase article. Please see the included EULA file for the full End User License Agreement before using this product.